ON NOVEMBER 18, there was a dust-up between farmers and fishers at Murthikuppam in Puducherry’s Bahour Commune over who would get to talk to the environment ministry’s representative visiting the area. The representative from the ministry’s Bengaluru regional office, U Sridharan, was there to seek views on the partially constructed fishing harbour by the Puducherry Public Works Department (PWD). While fishers favour the project, as it would help them berth boats closer ho me, the farmers are concerned about increasing salinity because the harbour would connect their irrigation canal with the sea. Environmentalists fear the harbour will increase coastal erosion. The harbour, though touted as a fish landing centre by the government, will also berth large boats and benefit half a dozen fishing communities having 10- 15 large boats. Currently, fishers closer to Puducherry town use the commercial harbour and those further south go to Cuddalore in Tamil Nadu, 20 km away. The harbour, cleared by the National Coastal Zone Management Authority in the ministry in 2009, will connect the Mullodai irrigation canal to the sea by cutting through the sand dunes near Murthikuppam. A jetty is almost completed in the canal. Two walls will be constructed perpendicular to the sea at the point where the canal will connect to the sea. Work has been halted till the dispute is resolved. The Rs 20-crore harbour, built with tsunami relief funds, could turn the Mullodai canal saline, worry farmers in the Bahour area. Mullodai irrigates 200 hectares of rice, groundnut, onion, brinjal and other crops around Murthikuppam, said G Sathiamoorthy, councillor from Bahour and a farmer. 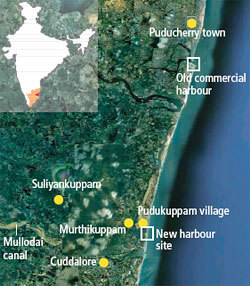 “This is the main agricultural area for Puducherry thanks to lakes and canals. The harbour will allow sea water to enter the canal and our crops will be spoilt,” he said. “This area has some 10,000 farming families, while the harbour will benefit only 600 fishers.” Fishers in Murthikuppam and the PWD deny the threat to agriculture. They say Mullodai was connected to the sea before the 2004 tsunami, so they are just opening up the natural path. Not all fishers in the region support the project. Those from nearby Narambai, Panithittu and Nallavadu villages contend the harbour will only be useful for large boats. “We are located north of the harbour and our beach will get eroded. Where will we beach boats? There are only half a dozen large boats. The rest are small for which beach is the best,” said A Kanagasabai, panchayat president, Narambai. Civil society groups like PondyCAN and INTACH say the harbour will exacerbate coastal erosion prevalent on India’s east coast. The walls near the harbour mouth will cause erosion to the north of the harbour and accretion of sand to the south. Erosion of beaches and sand deposition by currents and waves are an annual process. Ports disrupt this natural process. “Everyone, including the government, acknowledges that Puducherry town’s beach was lost due to the construction of the commercial harbour to the south. The government has not done anything to restore the beach,” said Probir Banerjee, president, PondyCAN. The solution was to continuously move beach sand from the southern end to the northern. “The Central Water and Power Research Institute in Pune has designed the groynes so that sand and water could be pumped across to the northern side. This was not done,” said Aurofilio Schiavina, a PondyCAN member working on coastal management. The government says the sand will be moved regularly at the new harbour. “Just because it was not followed at the old harbour does not mean it will not be done at the new,” said G Theva Neethi Dhas, Puducherry environment secretary. Just because the sand was not moved in the existing port does not mean that they would do it in the new port also. Isnt it foolish not to learn from an existing problem and still repeat it just because few politicians and ministers will earn some money as commission/bribe from the contracts? The reporter has not done justice to the issue. You need to fully understand the ecology of the area before writing such neutral articles. Actually the point I was trying to make, perhaps unsuccessfully as your comment indicates, is that the government has ridiculous excuses and nothing more. Just because I quote the government officials does not mean I endorse their view. Considering the amount of space given to those opposing the project, I would hardly say I was being neutral on the subject. In fact, listening to pro-project opinions with an open mind was rather difficult for me considering I have grown up in this region, have lived in Pondicherry and seen the disappearance of much-loved beaches over the years. But as a journalist it behooves me to listen to all points of view, however abhorrent. As for the fishers who support the project, they too live in the vicinity and have the right to be heard. Yet I have made the point that the project benefits only a handful of people while the fallout is greater.